Day Two of anything is easy to show up for, but harder to follow through on. And today is that day. Here are five new things I've tried in the last year that I've decided I absolutely love. Doesn't it amaze you that you can turn around and find out there's something new for you to learn? It amazes me for sure. 1. Frozen Grapes. Okay, minor obsession. To the point I can't really have them in the house too much because I will eat the entire bunch. No, I'm not joking. One pound? Easy. Two pounds? Mmmhmm. I hazard a guess that I might even be able to eat three pounds...I can't help it! But there is something so satisfying--icy cold, the snap of the skin, then the give of the crystallized grape inside. It's like eating bite-sized, grape flavored (REAL grape flavor!) popsicles from Mother Nature. Yes, they are that good. Buy a bunch, wash, dry, freeze. Thank me later. 2. Reynolds Super-Strength Heavy Duty Foil. Okay, I am in no way affiliated with the company. I bought the heavy duty foil because it was cheaper than the same size roll of the regular stuff. Who am I to ask why? But I WILL save even a dime if I can--and the difference here was more like a dollar. I will never go back. Do you have any memory of your mom or dad or grandparents saving foil? Washing it, smoothing it and then using it over and over again? THAT'S THIS STUFF. It lasts and lasts. I LOVE this stuff. 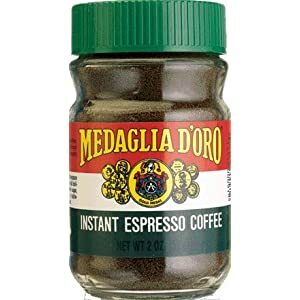 3.Medaglia d'Oro instant espresso powder. There is a chocolate creaminess to the stuff that no other instant powder--and few real coffees--have. I cannot explain it, but I love it. My house is now never without it. 4. Rice cooker. Okay, I have to admit, I fought this--I don't do gadgets. Then I inherited one with my new apartment (it just got left behind)...it's a tiny one, but I LOVE throwing rice and water in and then walking away. Mind you, that is almost what you do with rice stove-top, but this never burns--when it is done, the cooker keeps the rice warm, it frees up a burner and it's non-stick, so I have an easy clean-up. I've been eating a lot of rice lately. 5. Milk Chocolate. There. I've said it. Okay, this is hardly new, but with everyone talking about how much they love love love dark chocolate, I've realized *I* really love milk chocolate. Good milk chocolate. The kind that just seems to melt and linger...Mm. 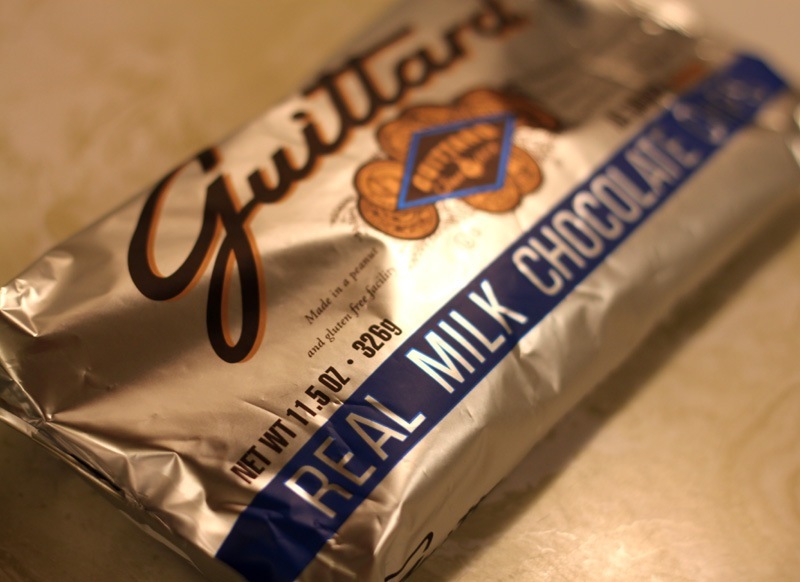 I even have a favorite brand, Guittard, which is hard to find. Once I found it at a Target near me...I bought a lot. 6. Bonus! I know I said five new things, but I kind of cheated with the milk chocolate, so I have to tell you about the best cookies I've ever tasted--ha, and they happen to be covered in dark chocolate (oops. so what if I said I love milk chocolate? See #5 above!). Marks and Spencer makes this extra-chocolaty ginger biscuit. Best cookie in the world. After writing this post, I had to go and splurge on a pack. They are hidden. And I won't say where. Let me hear what YOU love--kitchen, non-kitchen, it doesn't make a difference. What's out there that we need to know about? oh, great post. I can't wait to see if people add to it. One of my best things *ever* is my LiveScribe pen. I'm a gadget person, ok, addict. But my LiveScribe pen has made doing interviews so much easier than I ever imagined. My second best thing is my Accuquilt cutter. I am an obsessive quilter. I've made well over 100 of them (hand quilted), but cutting the fabric is a chore and I mess it up a lot. So I asked Santa a couple of Christmases ago if he would go halfsies on a cutter and he did! Oh my, what a difference it makes in my quilting life. Oh, and my Kindle. Love, love, love my Kindle. I have an iPad, but my Kindle is my reading pleasure. I love my iPad for everything else, but reading. Wow, do I have anything non-techie that is my favourite? I'm not sure! Your blog always makes me hungry, and the products you've listed here seem so exotic to me. But a few I've recently grown to love: coffee bean grinder (simple kind) and teapot (who knew I'd love loose tea so much?!). A food that I had to close the lid on: Nutella. That stuff is delicious! I was putting it on bananas, orange slices and peanut butter -- whatever I could find in the kitchen, because it tastes so good. Yikes! Great post! I'll have to try those chocolates. I'm a major fan of milk chocolate and haven't found anything that compares with Cadbury in London. My add to the list: Method products. Disclosure--my husband just started working for the company, but even if he hadn't, I'd be in love. I am obsessed with the small laundry detergent, body wash and dish soap. Love frozen grapes too! So decadent and yet healthy! I want to try everything on this post—especially the ginger snaps in chocolate? Two of my favorite flavors - yes please! Ladymoxie: true story. I wrote this post and then went and bought the ginger snaps NOT ON SALE. Then hid them so I can have one when I like and they won't get SCARFED by my family. Oh, and this. When buying the ginger snaps? I discovered milk chocolate covered ORANGE-flavored biscuits. See above: LOVE milk chocolate. I bought those, too. Not on sale, either. Hid them, too. Those cookies sound AWESOME! I absolutely love ginger and chocolate and will be keeping my eyes open for them. I like milk chocolate too. And - even worse - white chocolate. I just had grilled grapes for the first time at a restaurant, and I loved them. I'm also a big fan of Michele's Granola. It's a local company for me (from Maryland). The granola is very hearty with big pieces of walnuts and, depending on the flavor, ginger, cinnamon, raisins, or chocolate. So good! 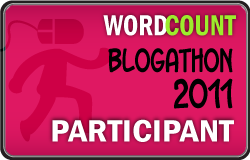 I think I love the blogathon :) ha ha- it has caused me to meet so many new people and learn new things. In the last year: 1) salmon and grits-Charleston, SC style - wonderful. 2)pepperjack cheese-Mt.Pleasant, sC - put on almost everything! 3)Twitter - the Blogathon gave me the courage to join 4) Pinterest - addictive 5)She Crab soup (again, Charleston....is there a pattern here?) Now I am going to have to try frozen grapes!